Hello there and welcome to this month’s edition of Brevard’s Coastal Angler Pro Tip. My name is Capt. Jonathan Moss, and this month, I want to share a recent incident I witnessed at the boat ramp. Public boat ramps are the place to go to capture the next viral video, a cheap laugh or maybe even a place to learn what not to do. There are numerous successful online publications specifically focusing on the disasters that take place at the boat ramp. That is because these incidents happen all the time. Recently, I witnessed an event that I will not soon forget. I was sitting in my truck, next in line to put my trailer in the water. I watched as a family attempted to launch their boat. Mom was on the dock with their daughter watching Dad prepare to launch the boat, while their son was sitting patiently in the boat. All seemed normal. Dad hops in the truck to launch and thus begins the disaster. Prior to hopping in the truck, the gentleman unhooked his trailer lights. No big deal, except the trailer has electric brakes. In some cases, like this scenario, the electric trailer brakes are powered through the light plug. When the brakes are applied in the vehicle, a charge is sent to the lights to turn on and to the trailer brakes to engage. Therefore, with the lights unplugged, the trailer brakes were in a locked position, and the gentleman could not back the boat up. Again, no big deal, simply plug in the lights and off we go. Oh, how I wish that was the case that morning. Unfortunately, when the gentleman got out of the truck to plug the lights back in, he left the truck in reverse. With the trailer brakes engaged, the truck did not move until the lights were plugged back in. When the light plug was back in place, the electric brakes now received power. Since the brakes on the vehicle were not in engaged, the signal was sent to the trailer brakes to disengage, and truck started moving backwards. The gentleman quickly scrambled and attempted to stop the rolling truck by pushing against it, but he of course was unable to do so. As I watched the chaos ensue, I leaped out of my truck, ran over, jumped in the moving truck and slammed on the brakes. Unfortunately, I was about one second too late, as the boat had jack knifed and slammed into the side of the truck. BOATS AND TRUCKS ARE MATERIAL THINGS. That was an expensive morning for this family. Both the boat and the truck were damaged. Those things are fixable and easily replaced. I felt sorry for the family and the situation in which they found themselves. 1. No matter your experience level, slow down, take your time, use a checklist and be safe. No matter how many times we do something, when we rush, we tend to make mistakes. Taking an extra 30 seconds to stop, process and review could save you a from a bad experience. If someone else is in a hurry and being rude, it is okay to ignore them and focus on what you are doing in order to launch safely. 2. PRACTICE. If you are anything like me, to master a skill, you must practice. 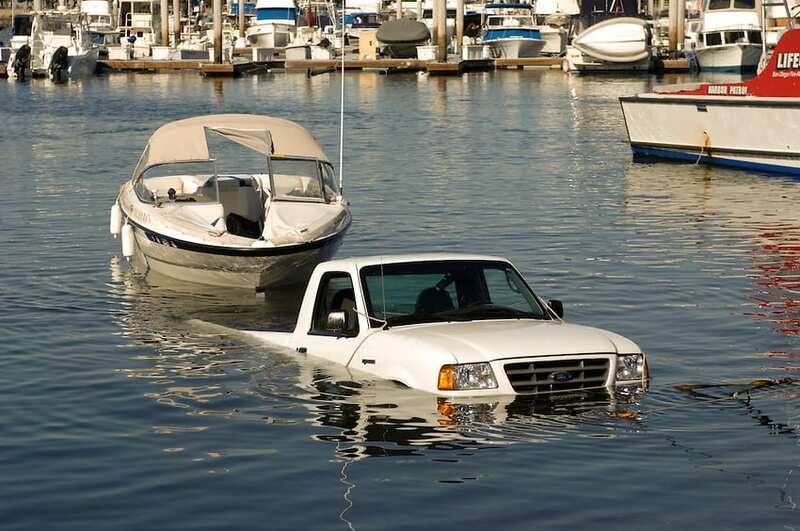 Practice launching and trailering your boat. Take a day off in the middle of the week, go to the local ramp and practice. You will improve at launching and trailering and gain more confidence in your skill. Launching a boat is a skill that must be practiced, and Saturday mornings are not the time to do so. 3. Help each other out! In scary or not so fun situations, we need to remember that we are all humans, and should lend a helping hand to those around us in need. Please, do not be the jerk at the ramp who is in a hurry and creating a stressful situation. From my experience, staring and yelling does not encourage others to move faster or efficiently. Let us all be kind and respectful on and off the water!